Opelika has a new landmark, thanks to former Auburn student, and current Auburn hat-wearing Miss America Mallory Hagan‘s aunt, whose house is now a lot easier to find. 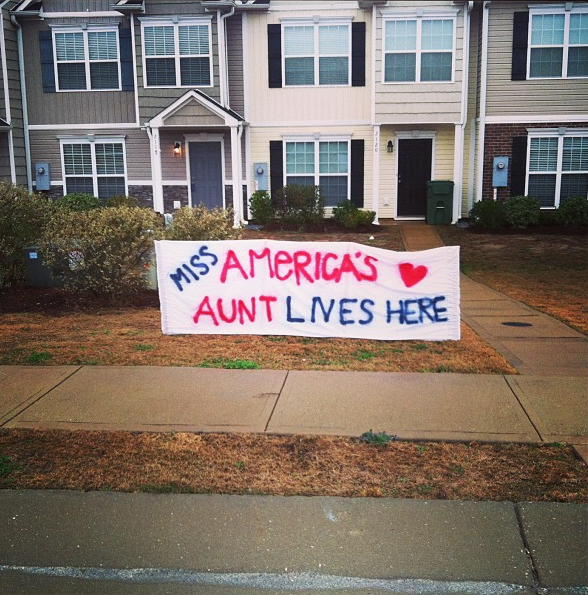 Here’s a shot taken this morning by Opelika resident Rachel Winter, Miss Auntmerica’s across the street neighbor. Miss America Mallory Hagan is from Opelika. AND SO IS HER AUNT!!! Hagan is also a former Niffer’s employee. We’re told Miss America’s friends and family (presumably including Miss Auntmerica) held a Miss America pageant watch part in a back room of the new Niffer’s location in downtown Opelika. And we’re told it was lively. Related: VIDEO: Former Auburn student (and Miss America) Mallory Hagan singing ‘Achy Breaky Heart’ when she was 4.